The Aten CL5708M is a Slideaway LCD with 8 Port KVMP Switch which is an integrated LCD console and keyboard, video, and mouse (KVM) switch that offers secure access to 8 attached computers and mounts in only 1U of rack space. It features independently retractable 17" LCD monitor and keyboard with built-in touchpad. The CL5708M supports either PS/2 or USB servers, and for added convenience an external USB mouse. 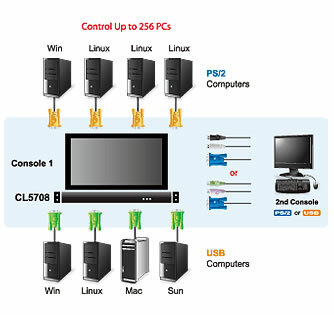 A single CL5708 can control up to 8 computers, and as many as 31 additional CS1708A / CS1716A KVM switches can be daisy chained together, for a maximum of 256 / 512 being controlled from a single console. There is no default user name and password for this device. Before the OSD main screen displays, a login screen appears requiring a password. If the password has not been set, simply press enter. For more information, see the manual posted above. Question: We need a 20 foot power cord, a 20 foot PS/2 and a 20 foot USB KVM cables. Are these available? Answer: Unfortunately, cables of that length are not available. USB and PS/2 lose functionality after about 15'. However, there may be some extension products that would fit the bill. Please give us a call at 1-877-586-6654 to discuss your project further. Question: what is the good feature of this switch ?? Answer: This is a versatile rack mount drawer with the common 17" display and the ability to connect both PS2 and USB targets. Answer: Thank you for your inquiry. We do not typically provide bid information through our KVM FAQ portal. To receive pricing and conditions, please either contact our sales engineers by phone at 1-877-586-6654, or fill out our project evaluation form found here: https://www.kvm-switches-online.com/project-eval.html. Answer: Thank you for your inquiry. Because user environments are so very different, detailed product support is beyond the scope of this FAQ. Having said that, here are some ideas. If on the other hand a password has been set and since forgotten, a password reset will need to be performed. This procedure requires powering down the system, opening the case and shorting a jumper. Full details for the procedure can be found in the manual on page 74 under the heading 'Clear Login Information': http://www.42u.com/pdf/cl5708-cl5716...page=74. Question: i want only the keyboard of the unit. is it possible to get? We offer a variety of Keyboard drawers with integrated KVM switches. You can also get the KVM used with the CL5708M (P/N CS1708A) and a Keyboard drawer seperately, and mount the KVM behind the Keyboard drawer. Question: Hi, what is the right cable (or extender if we want to go further away) to connect the external console? Thanks. For longer extension distances or a recommendation based on your application, please feel free to contact your KVM Switches Online sales representative. 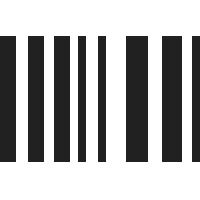 Question: Could you give us the Export Control Classification (US / UE) for Aten CL5708M? The ECCN (Export Control Classification Number) for the Aten CL5708M is 5A992.